The most indebted government of the world is at it again, and this time even more vigorously. Japan’s national debt is between 230% and 250% of GDP, depending on who does the counting, compared to debtor-nation USA, at 105%. It has one of the worst credit ratings of any major developed economy; Standard & Poor’s rates it A+, four notches below the top. ¥0.29 trillion in Japanese REITs. And yet, despite this enormous stimulus from dizzying money-printing and ceaseless deficit spending – in many years, half or more of the outlays are paid for with borrowed money – Japan’s economy has been vacillating between growing a little and shrinking a little for years. Now it’s shrinking again. It shrank in the October-December quarter, and it’s likely to shrink in the January-March quarter. That would be a technical recession. Just today the Nikkei Flash Manufacturing PMI dropped from 49.1 in March (below 50 = contraction) to 48.0 in April, the fastest deterioration in three years. The output index dropped from 49.8 in March to 47.9 in April, the fastest deterioration in two years. Japan is a great country, and it has a vibrant culture that I love (and that, full disclosure, I’m married to … see my mother-in-law Japanese doll artist, Tomoko Ikeda), but it’s a terrible fiscal sinkhole. In a free market where money-printing didn’t exist, Japan would have already defaulted on its debts because it could not afford the interest rates investors would demand to buy its crappy debt, and so it would not be able to service its old debt with the proceeds from issuing new debt. That inability defines a default – and the harrowing debt crisis it would engender. Turns out, no one is buying Japanese debt, other than the Bank of Japan, which buys every JGB (via its “primary dealers”) that the government issues and every JGB that isn’t otherwise bolted down. 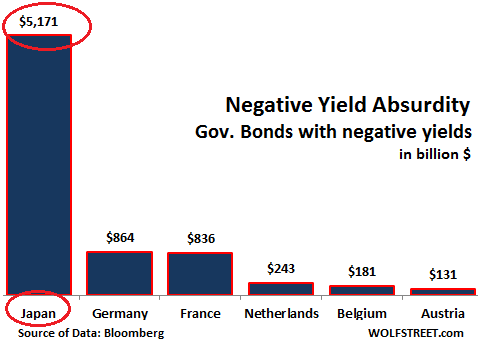 This relentless buying pressure, topped off with the BOJ’s new negative-interest-rate policy (NIRP), has driven yields for much of the huge mountain of government debt into the negative. So the government – the worst fiscal sinkhole among developed economies – gets paid to borrow. The more it borrows, the more it gets paid. Its horrendous deficit has become a profit center. An absurdity. But there is a price to pay…. These policies, while they’ve failed miserably in stimulating the real economy, have created enormous distortions. They’ve screwed up economic fundamentals, such as pricing of risk. They’re depriving consumers (retirees, like my in-laws) of income from their savings. They’re looting pension funds. Consumers and businesses have responded by cutting back spending and investing in Japan. These policies are strangling demand. Such a discussion could happen in conjunction with any decision to make a deeper cut to the current negative rate on reserves, said the people. An excellent effort at market manipulation. As soon as it was leaked Friday morning in Japan, bank stocks rallied, and stocks globally recovered after having been rattled by the disappointing earnings reports from Microsoft, Alphabet, Starbucks, and the like. The BOJ’s loans to Japanese banks at negative rates aren’t going to increase lending and investment in Japan. Interest rates on loans are already low. The problem is there’s insufficient demand! And there’s insufficient demand because, among other reasons, these policies are strangling demand! So Prime Minister Shinzo Abe is getting ready to announce an umpteenth “supplementary budget” of ¥10 trillion ($9 billion), the same strategy that has gotten the Japanese economy totally addicted to government-deficit-spending and that has failed miserably in boosting growth. The new package is promising all kinds of things, such as higher salaries for childcare workers (on the public payroll). The government will have to borrow this additional money. But no problem. The BOJ will mop up the additional bonds when they’re issued. It’s “helicopter money” pure and simple, just in electronic form. They’ve done it for years. And it hasn’t boosted the economy. But it has succeeded in leaving the country in the worst fiscal mess imaginable. But nothing matters anymore these days in the Japanese economy except the Bank of Japan. It is far beyond the point of no return. Absurdity has taken over. And absurdity will rule. So why is the yen so high and seen as a safe haven currency? And why should it be difficult to lower the yen- if a company wants to dilute its stock isn’t that just a matter of printing (issuing) more? Or is that not a parallel? The value of money gets depreciated by inflation. Japan has little or no inflation. It might have a little deflation. So the yen retains its value in Japan (and has mostly for 2 decades, unlike the dollar in the US). How other currencies react to the yen over the short term is a different matter, depending on how traders feel like trading. Ultimately, over the long run, inflation destroys a currency, not exchange rates (they bounce back). And as long there is no inflation in Japan, the yen will bounce up and down, based on trading. But it won’t siprial down forever, like the Argentine peso that has lost 95% of its value over the last 12 years or so due to inflation (and removing a currency peg). Everything is a fraud. Ratings agencies , data banks , government data . Everything is a fraud !!! I haven’t read about the yen carry trade or any others for a good while it seems. It’s not something I ever actively followed but would just see various reports from time to time Do you think NIRP/ZIRP has squelched this activity? I guess I’ll attempt to answer my own question. In this period there’s high demand for so called safe-haven flow, and historically inflation in Japan has been about 50% lower than in the US. When weighed against the euro, it’s not even a contest: during most of the EMU existence inflation in Japan has floated around 0% while in the EMU it has been far higher, especially in so called Club Med Countries (this higher inflation in Italy and Spain than in Germany and The Netherlands despite a sole currency has long baffled most analysts). That’s the main reason, despite the BOJ and the BNS “valiant” efforts, the yen and the Swiss franc have refused to roll over and die. A secondary reason is the carry trade: investors in Japan and Switzerland have every incentive to borrow in their own currencies due to highly repressed interest rates, and buy higher yielding assets, chiefly US dollar-denominated. US T-bills may have minuscule yields, but that’s a whole lot more than than JGB. I am sorry but I do not believe that Japan has no or near no inflation. The numbers are being played with, just like they are in the USA and China. They have to import oil, food, raw materials for manufacturing, not to mention finished goods they don’t make…think airplanes, washers/dryers/ more. . Remember all this one world stuff? For heavens sake the USA is making their cars! If those items cause inflation elsewhere, then they are doing the same thing in Japan. Japan has one of the highest costs of living in the world. Yea, the USA has no inflation either until you need to buy something. That is the key. Japan has DEFLATION in some big sectors that are still slowly deflating from the 1991 over priced market. And some inflation in imported commodity’s net 0. They have not removed a lot of items from their stat pool like the US to AVOID inflation being publicized. In Japan may of those items are in deflation. The American dollar has lost 95% of its value over 100 years. That is the same inflation as Argentina but over 10 times the period. What is that type of inflation called?? It’s obviously hardly worth a mention when discussing inflation but it is still a massive decrease in buying power non the less. This devaluation is almost an abstraction to the younger crowd. I can think back to the early 70’s & remember how a young person could get by on their own with almost any job. I did. You could rent an apartment, run your buggy down the road, pay your living costs & still have some fun money left on a meager salaried job. Then, fast forward to the present, look what it takes $ to get by & it puts some real perspective to the ongoing devaluation. But but but capitalism and free-market work! Yeah it works alright, but at what cost?? I once counted up all the financial collapses/bubble popping over the years in America and the number was 15. Each time the “little people” get whacked. This is why Democratic Socialism was invented, to ameliorate the pain inflicted by Capitalism’s serial collapses. Democratic Socialism, code for FREE FREE FREE. Wealth redistribution by legislation, and taxation. Transferred from the wealthy to the street mass of do nothing takers. Is at the root of ALL of those collapses. As the do nothing taker street mass always takes to much, and overloads the system. There is no such thing as a “Free Lunch”, somebody paid for it. The democratic socialist is always happy, as long as somebody else, is paying. Enforced by his taker Street MOB RULE through legislation. Which he calls “Democracy at work”. Street mob taker democracy, is at the root of the democratic system failures. It destroyed Rome, and many others along the way since. It will always destroy, until the system is modified, to take away the power of the Street Taker MOB, and more importantly those like Comrade Bernie Sanders who pander to them, at the Ballot box. The MOB demands wealthy people, work, and pay for everything. Whilst they enjoy FREE FREE FREE (like bernie says everything we need FREE) and no financial strain. The end result is always greater financial strain and pain for the do nothing taker street mob. As it refuses to accept. There is no such thing as a “Free lunch”. Democratic Socialism is an attempt to ameliorate the historic predisposition of Capitalism to accrue ALL wealth, power and privilege to a few. This is today’s reality whereby we have 44 individuals owning as much wealth as 165 million of their countrymen. Perhaps that is fine with you but when those at the bottom are working harder for less and those at the top are working no more but earning 350 to 1500 times more than they were 30 years ago it reveals a system that punishes the vast majority while massively rewarding a very, very few. That does not feel healthy nor sustainable. I think a balanced look at whom is taking and whom are being taken advantage of would lead you to rethink your ideas. Just add up the myriad of tax advantages the rich have, starting with the free lunch or should I say tax subsidized lunch that an average person cannot even imagine but which is enjoyed quite regularly by the well off. No need to look at crises and collapses. Bigfoot’s simple observation is ample evidence the current economic system, with its elaborate stats and measures, is disjointed from the human needs, and by extension, human’s happiness. It’s harder for the ordinary person to own something without contracting debt. It’s more expensive to own quality products, to eat quality food, to receive quality education, etc. GDP this, GDP that. If we are really producing more and being more productive, how come we don’t have better purchasing power? How come the ordinary person can afford only but crappy stuff? If this system really works, how could that be?! Wolf, how about this.. the BOJ tries to weaken the YEN via QE (aka massive bond buying), and the Yen goes UP instead of down because of all those front runners BUYING the Yen in order to grab those bonds and flip them to the BOJ for a profit. Delicious isn’t it? These front-running entities are the BOJ’s primary dealers, mostly. They get all the new supply. And they sit on a ton of their own JGBs that they’ve also been selling to the BOJ. This has been a really good business for them with guaranteed profits. I have to agree with Wolf. There is no legitimate excuse for inflation. It implies an unstable currency. We moght agree that everything in the united States is worth 100 trillion dollars and issue money to that amount. I also believe there should be some kind of physical tokens maybe held by the central banks that back every dollar issued. i am thinking of something like Bit Coins. I do not believe money should be purely electronic. That invites serious abuse and undermines confidence, the real source of the value of money. Finally, the money supply should expand only if the inherent value of the United States increases and then only by just enough to accommodate the estimated increase in value. We need to emphasize stability in our economy rather than growth. Never has a bug looked so hard for a windshield. Yet it keeps on flying. Productive capacity seems to keep them in the game. The massive subsidization route has it’s roots in the Japanese public transport system, from there it’s grown huge tentacles to the point it’s beaming radiation in every direction. Truly a public transportation business model envied by every developed nation racing toward socialism and away from an unfettered free market economy. It’s all about the need to control every aspect of your life, inclusive of your savings which they intend on stealing from you and your children. It’s superb. For us infrastructure-and mass-transit-challenged Americans, it’s like a dream. I love the speed readout in the Shinkansen carriages 240kmh + over rice paddies, and the drink in the glass/cup in front of you does not move. Many Japanese Pension fund invested offshore, for the reason you elaborated on. I would hate to be a pension fund manage these days, the R/R ratios are horrendously wrong, everywhere you look. The Japanese banking NPL problem is over 23/24 years old now. Inflation and economic recovery have not come to their rescue. There was talk they were starting to enforce the write down of some of them then it went away, Have you any updates on this. I believe NPL’S/NPB’S globally are at the root of this global stagnation, And that a healthy dose of enforced Darwinism is in order. A lot of this digitally created Financial sector wealth needs to be digitally erased. Not dripped away to eliminate annual banking system tax bills. EU Bailin’s were a step in the correct direction, but Italy is still being protected, its banking system is way more exposed to NPL’S than Japan. It’s a mystifying boondoggle. All the rail lines run at a loss but if you stand at the wicket and watch the endless hordes pouring through, one wonders where the expenses are going to. Rumour has it the rail lines contract everything out at massive fees to crony contractors as the government has some not-so-secret liability promise to cover shortfalls. Same for the toll roads. Massively expensive projects built by the government and sold to private enterprise for a song. But you pay 5000 yen ($40?) for a 10k trip. Japan is riven with keiretsu (actually zaibatsu) like Mitsubishi Heavy Industries sucking off the government teat. A very large proportion of government stimulus is fed to these corporations via useless roads to nowhere and defense spending which is capped at 1% of GDP but is circumvented by a number of measures. 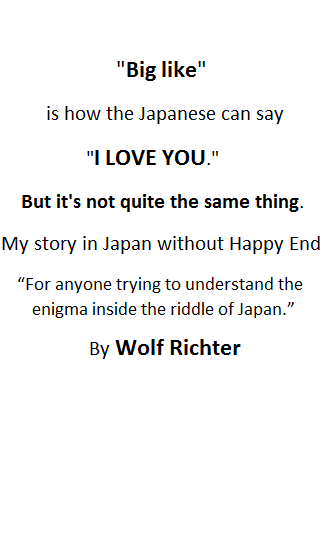 To Wolf: I also married Japan! The subsidized transport system in an “INVESTMENT” (and a wise one on which the society and the investors get a return) in the urbanized society. 500 Yen Highway tolls, per segment in urban zones, 5000 would be untenable, especially with reducing wages it would be cheaper to pay drivers to sit in traffic again. Kids used to buy 1 segment, then race on the Hanshin loop all night. For sure, the Tokyo loop is just 500-700 yen whatever (forget) But driving to Yamanakako from Yokohama is 5000 yen+.. I don’t remember the clicks but it wasn’t excessive. I drove from Tokyo to Osaka once, on the free road’s (Tokiado highway.) for the experience, Leaving at a normal 0700. Its less than 600Km 370 Mls. Spent more time sitting at traffic lights than moving, 11Hrs journey. Mind you its amazing what you see sometimes, sitting in traffic, in an elevated truck cab, in that country. If you think transportation is bad, defense contracting in Japan has long been the stuff of legends. The JSDF invariably ends up overpaying everything several times over… to the benefit of local manufacturers such as Mitsubishi Heavy Industries, Japan Steel Works, Kawasaki Heavy Industries etc. A typical method to allow contractors to skim cream off the top is to place small yearly annual orders instead of a single large one when, say, a new lorry or artillery piece is needed. Unit price shoots into the stratosphere and with it profits for the manufacturer. A symbol of this boondoggle were the F4 Phantoms bought by Japan in 1968. Every single F4 sold in the world (Spain, Israel, Turkey and Western Germany were among the customers) was manufactured by McDonnell-Douglas in the US, bar those used by the JSDF. It’s not exactly known how Japan managed to obtain manufacturing rights: given in 1968 Japan had overtaken Western Germany to become the second world economy, it could not have been sold on grounds of helping the local economy getting off the ground. Due to the need of setting up a second production line and chain of supply, the JSDF ended up paying paying these aircraft over twice what they would have cost if bought directly from the US. While your analysis appears to be correct, it also appears to be incomplete in that it does not consider the aggregate economic effects and corollary benefits, e.g. cnc machine tools, robotics, cad/cam, materials. My brother was a F4 RIO [USMC] and had ample opportunity to compare the JSDF and MD versions of the F4. The quality, fit, and finish of the JSDF F4 was much better, not only of the air frame but the components. Additionally, by domestically producing the F4, the Japanese conserved foreign exchange, provided employment for high skilled/pay workers, and developed their general aircraft production infrastructure and knowledge base. Domestic production also avoided the threat of an embargo on spare parts. Bingo chiken! Nailed it on the head! Governments won’t even need to push for socialism, the citizens will ask for it just as it’s happening today with the Bernie followers! When economies fail and peoples security at stake, socialism will prevail! I believe that most Bernie supporters are more interested in Justice for All rather than Socialism. Bernie is the only candidate that is actually against the predatory actions by Wall Street and the elite with no accountability while the poor go to jail for not having the mandatory insurance required of them because most of the jobs they can get don’t pay a living wage. Oh, you didn’t realize that driving with out insurance is a criminal offense in most states? Or that multiple offenses constitutes a felony? There are hundreds of reasons to support Bernie other than his socialistic stance but only given a choice between the current Crony Capitalism that is enslaving the population and Bernie’s Socialism? That is why the youth are supporting him, not because anyone really thinks socialism is a great or total answer to our future. What amazes me is that he doesn’t have a massive majority of support because all of us know that the current way things are is not sustainable and will lead to some chaotic conclusion. We don’t need a religious theocracy or a totalitarian blunderbust or a sold out war monger/Wall Streeter for our next President. We don’t have good choices and I personally support Bernie as at least representing my views in actual Justice for All and not just punishment for the poor and disenfranchised. Bernie doesn’t have a larger following because most women are stupid, as a woman I know it only too well. They think a woman in the WH will help them increase their status in America. Other then marrying a guy who became president and riding his coattails, I can’t come up with one accomplishment to her credit. If only Bernie could say this. Bernie is not in any way a real socialist, he is a populist, the American version of social democracy. He believes that the well being of the American people as a whole should take top priority in his policies and I tend to agree. I’m sorry, but I fail to see the connection between strict government controls & free markets. It seems that the strict government controlled market is the antithesis of a free market IMHO. How could a market possibly be free if it is strictly controlled? It also seems to me that the flourishing coterie of monopolies & oligarchies are in fact what we have due to those strictly controlled (financed/funded) government markets. As far as definition of the various the ism’s go, I find them to be merely a distraction. Is there anything you could provide to alter my conclusion? Or monopolies are the natural end state of “free” markets. See U.S. history. Here’s some history for you & IMO free markets don’t exist. According to the history I’ve read, most monopolies have been created through gov intervention. Did the us postal service spring up from the free market? Yet they have maintained a stronghold & crushed legitimate competition. I get where you’re trying to go but the debate control/free is both philosophical & political. Do the healthcare, agribusiness, utilities, intellectual property or transportation monopolies that exist stem from a so called free market, government intervention, or perhaps some form of both? I would concede that strict government controls of various markets could possibly be a good thing IF the gov was really of the people, by the people, & for the people. We live in a state sponsored corporatocracy that has evolved over decades of state sponsored monopolies. See US history indeed! That is the dilemma isn’t it! Free Markets are never FREE and governments always over protect, usually for the benefit of the few. The freedom enjoyed by many in the US that allowed a large middle class was in a large measure an anomaly. It was for the most part a product of the Marshall Plan whereas the US being the only functioning manufacturer left after WWII put its entire population to work supplying food and products to both Europe and Asia. Then we ran into the problem of competing with those we rebuilt and along comes Reagan who put us on the destination we have arrived at today. The question isn’t whether we go back to something that was a one time thing and then didn’t work or we forge forward with some new plan OR we just degenerate into chaos.. I can’t see a road back as the past circumstances are no longer available. The road forward is fraught with uncertainties and issues to solve and at this point the only person on the stage that isn’t trying to go backwards is Bernie.. In a free market the big players inevitably end up dominating the market and as a result destroy its freedom, doing everything they can to protect themselves from genuine Capitalist competition. You need government intervention, not to micromanage the corporations as in the Soviet scheme,but to keep this from happening (think “trust busting” and to keep the market fair, free and competitive (think “conspiracy in restraint of trade). When in the past the government was effective at keeping the big corporations in line and it worked fairly well. There is more honor among thieves than their is in big business. How can you be so incredibly naive, so blind to history and current reality as to even imagine that the big players would voluntarily restrain themselves so as to keep the market free and fair? Our current situation is not the result of excessive regulation but of deregulation! How can you deny what is so painfully obvious to everyone? Bigfoot, think what would happen if you got rid of all traffic regulations and restraints? Doubtless the very excessive mortality of the especially reckless would provide some measure of the situation but it would be a bloody mess and you would take your life in your hands in a big way every time you left home. Teddy Roosevelt once said that the only power that could protect the American people from Big Business was the federal government. i think he was right and that you are far too trusting in the good nature of the people at the top for your own good. I appreciate your response. I’m not sure how you concluded that I have this immense trust for people at the top. Taint so & is indeed quite the opposite. I’ll emphatically state that there is no such thing as a free market & there hasn’t been in the entirety of my lifetime. We’ve all been raised in a highly controlled propaganda filled matrix & it seems that very few have taken the time to question everything & seek answers to those questions. Did you just finish testifying against yourself (under regulatory force) & under threat of imprisonment to meet the tax deadline ? Read those 70,000+ pages of tax regulations did ya? Feeling free? I can’t understand how you can look at known history & say we had a free market in the last 100 years or longer. Exactly when was it in the past that government was effective at keeping big businesses in line? Examples? It’s the exact opposite! If you take the time to actually investigate how the multinationals came into being, the government connections are easily discovered. I really don’t think you have done your homework regarding how we got to where we are now. I’ll be happy to supply you with some links should you have a true desire to expand your knowledge base. The large multinationals along with the finance cartel have been in bed with government about as long as their has been a government. They were/are instrumental in bringing about the corporatocracy we live in & they are trying to increase that control through NEW REGULATION/LAWS. That crony capitalism & corruption have been rampant & in collusion with government regulations is so easy to decipher. Why do 10 major companies control the largest % of our food production & distribution? As I alluded to in another post, we have a government sponsored agribusiness monopoly. The little guy has been effectively squeezed via regulations, subsidies, favoritism, etc. not the opposite. Do you really believe that some government official will insure a “fair” marketplace?????? If we got rid of traffic rules & regulations the gov would be able to steal a lot less from us, that’s for sure. I think it was somewhere around $ 2.5 billion that was confiscated last year in traffic stops.Try getting your money back. Thanks for your regulations. Thousands of people are killed on the highways annually by drunk drivers. Do we need more regulations? Why aren’t there massive pileups at traffic circles? People don’t want to crash so they are careful & self regulate. I live out in the sticks. I can blast down the road at 90mph with 99% confidence that the “man” isn’t hiding out. I don’t because I value my life & others as well as the critters that are commonly near the roads I traverse. The reality is you put yourself in peril every time you drive the public roads. Think of the thousands upon thousands of cars that have passed you heading in the opposite direction. Was the fact that they didn’t run into you (hopefully) or you into them because of a government regulation or due to self regulation. Decent people self regulate & the ones that don’t just ignore your regulations. Driving right versus privilege & associated “regulations”. Not the place & I certainly don’t have the time. You can claim I’m blind & naïve to realities & that everyone else in the world but me sees that it’s deregulation that’s the problem. A bold proclamation indeed! So the implication is that you & everyone else believe we need more regulations? Will that fix everything? It’s easy to make blanket statements like that. Why didn’t you include some of these wonderful new regulations that you say we need in your post? Get specific. It’s easy to take a philosophical stance, not so easy to spell it, is it? My overall belief is that whether it’s business or government, there is always going to be those evil, corrupt, greedy, power hungry bastards that want more. More of everything. Most all major governments rule their people through the threat of force & that has been a given throughout recorded history. I came to the conclusion a long ago that there isn’t any political system that can work over a long timeframe due to the inherent corrupt nature of man. While there’s a lot of good people in the world, the corrupt always seem to rise to the top with the control mechanisms. Put 100 people in a room & try to come up with your utopian vision of society. Now try it with 100 million or 300 million.Go back & reread my last paragraph in response to Bead. You wrote absolutely nothing that would change my view & cited no examples related to your position other than your traffic deal. Citing TR’s comment about government protecting us from big biz comes across as almost hilarious (mostly sad) especially being the warmonger that TR was. All I heard were generalizations. That’s OK. I still applaud your effort. Few credible observers claim totally unfettered “free markets” lead to a stable society. Wealth tends to want to concentrate (call it monopolies or crony capitalism or corruption). Appropriate regulation is necessary. The trick is “appropriate”. For example, it is appropriate that the SEC regulate to ensure all traders get objectively determined and timely executions on stock markets; it is not (yet) appropriate for the SEC to ensure “minority group x” makes as much profit as “minority group y” in the stock market. There really is no such thing as a large-scale totally free market (some are just free-er than others). Humans have simply not found a better way to allocate resources for large-ish economic systems than an appropriately regulated “free market”. This subject is so deep that I doubt a short response will be sufficient. Although this is a long response, I don’t have time for an essay which is probably needed to convey my thoughts in a proper manner. I’ll try not to post my response with direct questions. If I do ask questions, it will be merely to have one give a consideration to the subject matter. I do respect & try to consider alternate opinions, especially when they are attempted to be delivered in a productive manner & thank both of you for opining. hidflect- Your definition of an assault & a robbery as a free market is quite puzzling. If I bash your head in with a baseball bat as you attempt to enter your vehicle, steal your wallet & your car, then leave you for dead, is this a free market action or just a free for all criminal activity? IMO- the crime you describe has nothing to do with a free market & I’m not sure why you chose this analogy. The remainder of your post deals with the socialistic nature of market control mechanisms & I’ll cover that below. In mentioning Somalia, they at one time had one of the most free types of societies on earth. One could research Zeer & Somalia if so inclined. Don’t worry, the us is there to fix it & with Vision 2016, I’m confident everything will be just grand./s I’ll get to self regulation below. Chip – My opinion can be swayed & I’m quite capable of adopting a different view of a subject than what I currently hold. That’s how I arrived at the point I’m at, by reading, study, & the consideration of another persons opinion, not to be confused with a personal attack. Thanks for not making it one. Here’s my general take. We all have a fundamental birthright to liberty, life, & property be that physical property or intellectual property. How this is carried out in a properly functioning society (certainly not ours) is through proper law. I believe in a natural law. It’s fairly simple but can lead to complexities. You shall harm nobody & when/if you do, a mechanism in the form of laws & proper force of laws needs to be in place to correct an injustice. This should be the only form regarding a force of law. The socialist mentality for societal organization goes back hundreds, perhaps thousands of years & is always implemented through unjust laws & backed by force. Here is a question for all the proponents of socialism. If mankind is so inherently stupid, bad, & evil that it is not safe to permit mankind to truly be free, how is it that the actions of all you social organizers always proclaim to be doing the collective so much good? Don’t you all come from the same evil, stupid, bad pool of this thing we call mankind also?? Reconcile that. A quote from one of my posts above, ” I would concede that strict government controls of various markets could possibly be a good thing IF the gov was really of the people, by the people, & for the people.” This is clearly not what we have in place. In our current model, our supposed liberties come from state mandate. This is completely backwards. Law must emanate from our natural born liberty. Many seem to think that through socialism & state ordained law that some form of utopian existence can be manufactured. How’s it working? Liberty is something that all people (?) instinctively want. Life, liberty, & property do not exist because men have made laws. They are not gifted by some legislator. What is law? I would submit that anything (law) that runs counter to the rights that all people are born with is unjust. Law should only organize true justice. The socialist seeks to mandate laws to organize labor, production, education, religion, philanthropy & all manner of business. By doing this, true justice (our liberties) are discarded, stepped upon, or destroyed. Remember, a government produces nothing. It is not productive & ours is highly extractive of societies’ labor & productiveness. Imagine for a moment all the other things that could have been produced had the financial fruits of our labor & productivity not been seized & squandered. It’s mind boggling. Law has become the weapon of the greedy. Forced conformity, forced financial equality, forced education, where does it stop ? Mass schooling is a relatively new phenomenon, maybe 150 years old. Law is not charity, or philanthropy. Once we start down this socialist path, it seems a never ending endeavor. Perhaps that’s why we have well over 50,000 laws. When the state is made responsible for everybody’s education, health, wealth & so on, there is a never ending need for more legislation from our wise socialist rulers because there is always some perceived inequality that the state must rectify through the implementation of even more (unjust) laws. I would submit that the vast majority of these laws trample our liberties. Just because I object to being mandated by FORCE OF LAW to the socialist call for tariffs, subsidies, regulation, welfare relief, public education, progressive taxation, public works does not mean that I object to something being done. To accomplish these endeavors through state sponsored plunder under threat of force is what I oppose. The use of the force of law, unjustly applied, has given us what we have today. Hidflect & Chip, I think you almost make this case for me. We see that we are organized under socialist principles & you both seem to acknowledge that. Chip, you are right. Nobody that you & most others listen to lends any credence to the proponents of an actual free & unfettered marketplace. Ask yourself why this is. Intellectually explore this idea instead of giving it only a few seconds of passive thought. We are told that the wealth tends to concentrate & list crony capitalism & monopolies as the outcome. Were these outcomes really the product of a free market or were they produced by the force of law, unjust laws?? If men are free to conduct business justly ( without harm to others) without the many socialist rules of engagement, would this not in fact provide a business climate where many more could prosper? Would we not have a more honestly competitive marketplace? How does the wealth concentrate & form a monopoly if ALL participate in a level playing field? This idea that a truly free market leads to chaos & monopolies has never been proven to my knowledge. This has been the outcry by the socialist engineers for centuries. They seem to believe/portray that a free market equals one with no laws, no rules. An anarchist free for all. Where are the real life examples? If you understand my writing, you know this is not what I propose. Our country almost started out along a proper path. We seemingly acknowledged life, liberty, & the pursuit of happiness (not to be confused with mere pleasure). Unfortunately we adopted 2 very unjust laws. Laws that favored a few at the expense of many. These were various tariff laws & legalized slavery, the absolute theft of everything about a person, their labor & productivity, their freedom of choice, movement, dignity or to have a voice in this new world supposedly founded on life, liberty, & the pursuit of happiness. What an abomination! But, those wonderful leaders & their business cronies were the main ones that profited from this set of “laws”. Slavery is most often attributed to the south (I acknowledge it did indeed flourish there) but in fact the prosperity of New York (New Amsterdam) was built upon the backs of slaves as were many other cities & regions. All this misery & theft was condoned by law. This is the main point. The slaves rights (almost none) & the rights of everybody came from the state, just like what the socialist agenda has given us today. This again is completely backwards from natural law. Many monopolies were created under this system & fortunes were made. This was not a free & just system because it was created through the force of law, unjust law. The monopolies today exist through the same unjust force of law. The truth is, we have never had a truly free market in this country. Not from it’s inception or at anytime since then. I challenge anybody to show me different. Chip, you state we need “appropriate regulation”. I agree. Where we would most likely differ is our approach to the term appropriate. I believe we first need an understanding of the science of economics, then the science of governments, a true understanding of liberty, & then what constitutes true law. A law that does anything other than protect our rights of life, liberty, & property is unjust. I can find some examples where various societies have come close to this, but the greedy always seem to take over. I’m ready for true change but pretty well convinced it won’t happen. The ship is sinking, just like all similar ships in history have. All I can do is prepare my little life raft the best I can & try to enjoy every day. hidflect- As far as pointing to the phone business as an example of what happens with self regulation, I don’t buy into your premise. Here’s why. Is it screwed up? I’ll absolutely agree about that! The history of our telecommunications industry is one of a very long state controlled monopoly. Follow the trail of laws from the introduction of the phone to present day. The theft of millions of dollars from customers through the cell phone providers is acknowledged. Freedom of choice is not the backbone of the industry & never has been. This industry is also one of the largest contributors to the political machine after banking. You have to look at the FCC, which began in 1934, to examine what it has done under their rule of law to see how & why this monopoly has lasted as long as it has. The FCC will extract $ 388 million from us for an operating budget this year. This excludes 1 time requests for another $ 56 million. From 1994 through Sept 2014, the FCC has collected $ 53.6 BILLION dollars in spectrum auctions. Please let that sink in for a minute. We have not been well served. This money seems to disappear down the government rabbit hole. These numbers come from the 2016 budget listed in pdf format on the FCC’s website for any that care to check. This is actually more than I had time for but I wanted to try to clarify my position as best I could. My views are based on liberty & what it means to me. I am not associated with any of the so called libertarian groups, democratic groups, republican groups, or any others. IMO, most all are headed down the wrong path. In terms of Japan’s national debt, almost 100% of it is held in Japan … much of it now at the BOJ. Foreigners hold almost no JGBs. A few years ago, 5% of JGBs were held by foreigners. It think that’s closer to zero now. I used to own JGB’s, which I bought shortly after Shinzo Abe was elected into power on a purely speculative endeavor: my bet was the BOJ would start a QE program, thus driving prices upwards. It wasn’t a whole lot of money, but the bet paid off and the money went towards another purely speculative scheme (Shanghai Stock Exchange) which gave a truly major payoff, albeit it took more time than with JGB. Right now I wouldn’t touch JGB’s with a pole, provided I could find any for sale: supply is effectively drying up. Like most sovereign bonds values are way way too high, and those values are effectively tied to QE programs which, in turn, are tied to politics, not fundamentals: Haruchiko “Kamikaze” Kuroda, the BOJ president, has an extremely narrow majority among governors. All latest BOJ decisions were passed with a single vote majority. If a Kuroda ally is forced to resign, retires due to old age or just changes his mind, the QE program is bound to run into a very serious snug, and I don’t want to be caught in it. The typical addict/enabler psycho-drama is being played out, and the usual ending disaster can be predicted. This is not an Economics problem, but a collective mental health problem. Japan shows the dangers of having nearly all your debt held internally. Everyone has read about how this or that country was supposedly at the mercy of foreign creditors because its debt was held by nations and parties outside its borders. Fine. That’s a real concern. But if your debt is held externally and the situation becomes completely untenable you can default and you hurt parties outside your country. Is default even an option for Japan? They’d be killing themselves, not the U.S. or U.S. hedge funds. Default is an unnecessary option the Nationalistic Japanese trust the National currency yen. They will keep on buying it,l as long as they own it and Japan. Somewhere I have a 10 Bu coin, 1000 Bu made 1 Sen, (Sen meaning 1000) and a 1 Sen note. 1000 Sen made 1 yen, not that long ago. Now 1 yen aluminum coins are the smallest denomination and most people have no experience of Sen notes in use. Men that carry 1 and 10 yen coins are laughed at, and local tolls roads are 500 yen, as there is a 500 yen coin. Japan has been printing money, and adding extra 0 to it, for a very long time. The Japanese problem (and the global one) is the NPLS, they are a post 80s problem, in a country where if you bounce 1 check they are still likely to bankrupt you. Japanese banks are still trying to avoid the social and economic havoc, that a long string of foreclosures will cause. The suicide rate’s would be huge. Bank mangers dont like to have those numbers laid on their desks, neither do insurance company’s. The Tokugawa Shogunate, was broke, for well over a hundred years, and simply kept rolling its debt, as its bankers allowed it to, the other options being untenable. The American Perry, injected a, Social, Political, and Economic, Upheaval, that lead to the Meiji restoration, Japans wars with china, and ultimately America. Japan has MANY nuclear Power station’s.. In the Era of Nuclear Weapons, Best America leaves the Japanese alone, with their internal debts, this time. On the flip side. If BOJ set rates negative 10% the debt would be gone in less than a decade. Debt on this scale is unsustainable. When the house of cards collapses the details of the carnage may be different if the majority of the debt is external or internal, but it will make little difference to the large majority, who will be forced back to a barter economy. Surely demographics have to count somewhere in the mix? Wolf, What percent of the working population’ s wages have to be diverted to support your in-laws? Your question is key for the overall economy. In terms of my in-laws, who are fairly typical, it’s a little different: They’re living off their own (dwindling) savings. And he gets a modest pension from his former big-company employer that he worked for all his life. This generation has had it pretty good, and they saved up a lot. That’s what they’re now spending, but they’re spending less because the money they saved doesn’t generate any income. And they don’t want to outlive their savings. They’re fit and healthy. And with some luck, they’re going to live a long time. They expect that, and they adjusted their spending. Given how large that older generation is in Japan, this is a huge issue in terms of consumer spending. The Japanese financial system will collapse when the balance of payments turns consistently negative. That’s why they’re so desperate to manipulate the yen lower. If Japan can keep buying its own debt and not ever suffer a catastrophic economic breakdown, why can’t the US or the EU follow this same pattern? Have normal economic laws ceased to matter and will they matter again, if so when? I’m so confused. Japan’s problem isn’t that it has a debt deficiency. It’s also not that it lacks capital. There really aren’t that many things it could be, but damn if TPTB can’t figure out what it is. And that is certainly because they don’t want to. AT SOME POINT IT WON’T WORK ANYMORE.